For a 22 minutes long special, this does its job. Heavily christmas themed, really giving that holidays feel especially toward the end. Character centric goofs are taken in consideration pretty well and the series own idea and comedy plays neatly with the setup. This entire thing is worth of watching solely for the scene where Retsuko gives her best wishes because it is totally cute and warm. It's nice to see Netflix do something fresh and wholesome for once. Recommended. Call me a Grinch, but even for a Christmas one-off episode, this thing is pretty underwhelming and really disappointing. I mean don't get me wrong, its still enjoyable, especially if you're a fan of the first season of Aggretsuko like me, but don't expect anything grand or hard-hitting. Otherwise said, let's delve into the holiday hellhole and rage against the tradition that is Christmas. This special has two convergent plotlines, one with Retsuko and her hyena coworker, Haida. This special takes place after season one, where Retsuko meets Haida in the hospital where Haida confesses his love to her. Unfortunately, things doesn't go according to plan and Haida spends his days feeling unrequited and quite gloomy. This episode spends a lot of screentime on Haida, so if you love Haida, you're in for a treat. Anyway, Haida gets wind of Retsuko's ever-so-changing behaviour based solely on her Instagram posts, and in order to win her heart, decides to muster up the courage to ask her out for the holidays. Now for the Retsuko plotline. As is the custom, Retsuko finds herself in a predicament. It's nearing the holiday season and Retsuko is once again lonely and in need of finding others to keep her company during the cold, winter nights. She asks everybody she knows but to no avail (which is odd since she later had no trouble finding company out of the blue, as oppose to the first half of the episode where she was completely struggling to get somebody to accompany her). She also spends more time on Instagram, inspired by her gazelle coworker Tsunoda, and tries to feign her way into popularity (this does add up to a really great comedic moment, I must add). My main problem with this special was that it felt completely unnecessary and didn't really advance the plot, characters, or the themes of Aggretsuko that warranted a one-shot episode. 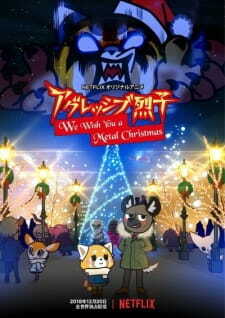 Aggretsuko always centered on Retsuko's fits of rage against the social traditions, like in Aggretsuko (2016) where in each Christmas special she would screech about her lonesome and pitiful life drudging through the holidays when everybody she knows was having fun with their loved ones. She barely get those epiphanies, and when she does get one, it was the most unsatisfying fit of rage because of how anticlimactic it was. Her character development doesn't grow in any sort of way and overall felt that this was all a set-up for season 2 of Aggretsuko. Even with all that said, I still enjoyed this special and there are some standout moments in this that I can say will please anyone who is a fan of Aggertsuko. If you're a sucker for a heartwarming and comfy comedy for the holiday season, then you can't go wrong with this. "Instagram is eating her soul!" "They're not gonna like this episode." As much as I would happily devour a big plate of Aggretsuko season 2 right now, this Christmas special was an unexpected and very pleasant surprise. A bit longer then the normal episodes of season 1, it not only addresses a plot point from the end of the first season, but retains all the charm of the cast and their various ways of celebrating Christmas. We even get a glimpse at Retsuko's ex on Christmas! This quick little Christmas special is not only funny, but heartwarming as well. Out of the few anime Christmas episodes that exist, this is definitely one of the best. I once again have to give props to Sanrio for turning what could easily be a cheap merchandise ad into a great show. Task 4: Watch a sequel/spin-off/OVA/special/etc. related to anything you’ve watched before. As a big fan of the Netflix reboot, this was a fun little surprise. Basically felt like a normal episode, just a little longer and less heavy metal, but whenever the metal hit it was worth it. The story really wasn’t anything too special, but it was still fun to be with these characters and get myself back into this world. While it wasn’t really necessary, it was still pretty fun. See it if you are a fan of the reboot. Sorry for the messy review, I just have written 3 different reviews and I’m starting to get tired and starting to make less sense. Absurd comedy, poignant drama, explosive action, and more are all on the list for our favorite anime of 2018!